June 4 2018. ANN ARBOR MICHIGAN – The early weather forecasts called for mostly sunny skies and 60 degree temperatures. As we approached the weekend, the forecast started to include the possibility of rain. By Sunday morning the forecast called for a band of heavy rain to sweep through at 8 am, right when teams were supposed to check in at the USATF tent. And it came right on schedule; the skies opened up and the rain poured down. Luckily runners could seek shelter, as pre-arranged, at an intermediate school in the staging area of the start. The heavy rain lasted only ten minutes or so and there was ample time for teams to make it to the tent and check in. The rain picked up a little again as the runners were doing their final stride-outs. But once the race got under way, it was mostly light rain or sprinkles, with mid-60’s temps and moderate wind, followed by clearing for the end-of-the race celebrations. All-in-all, conditions were good for the tour of the scenic rolling hills along the Huron River. The race to be first Masters Athlete across the finish line overall came down to a terrific battle between Greg Mitchell of Oregon’s Bowerman Track Club and David Angell of Virginia’s Roanoke Valley Elite. The lead pack, consisting of Angell, Matthew Folk, Jonathan Frieder, Mitchell, Sam Teigen, and Olivier Vrambout, were taken out at a brisk pace by Mitchell. Once they got onto the scenic 8 mile stretch of Huron Drive, Angell, Mitchell, and Vrambout worked to establish a gap to the rest of the pack. But Mitchell and Angell first pulled away from Vrambout, who was left in no man’s land. Shortly thereafter Mitchell laid down a surge that Angell could not match, pulling away to a lead that grew to 30 seconds by the ten mile mark as Mitchell went through in 53:20. By that time, Angell’s 53:53 gave him a minute and 20 seconds on Vrambout. Vrambout, in his turn, had about a minute on a chasing pack of three: Folk, Frieder and Teigen.To my surprise, alphabetical order and place order were the same. Despite Folk having run two sub 1:14 Half Marathons in the last year, I failed to see that he could run with Frieder and Teigen who had run so well at the 8K and 10K National Championships this spring. At ten miles it was Folk in 56:12, with Frieder 8 seconds back and another 6 back to Teigen. Mitchell poured it on over the last 5K to pull further ahead of Angell, breaking the tape in 1:10:36 to Angell’s 1:11:20. Run Minnesota’s Vrambout toughed it out to complete the podium despite a strong closing finish by Folk who cut the ten mile gap in half. Vrambout took 3rd in 1:13:28, with Follk 4th in 1:13:58. Mitchell made it a successful return from an extended injury period, winning his first national championship since the 8K in Brea California in early 2016. Angell just missed his 3rd straight win on the Masters Grand Prix circuit but maintains a comfortable lead for the 40-44 Grand Prix contest. Vrambout conceded that this was perhaps one race too many in a compressed time period. But landing on the podium in a National Championship is memorable in itself. And there are many future opportunities for Vrambout. Folk had a fine debut performance. Frieder and Teigen showed they can run with the best in the Half Marathon and led their Men’s 40 and up team to victory. Melissa Gacek, of the Twin Cities Track Club, rolled to a comfortable win in 1:25:03 as the Women’s field split up early with Gacek in the lead and a pack of chasers including Melissa Broyles, Doreen McCoubrie, and Michelle Simonaitis. Gacek’s coach had directed her to run steady 6:20 splits but the rolling hills made that difficult. In fact, Gacek noted that her splits were inconsistent, depending on the extent of uphills and downhills within the mile. Nonetheless, she hit the 10-mile mark in 1:04:23 for a 6:26 per mile average, no small feat considering she had no close competition. Simonaitis, the pride of Draper Utah, was the closest of the chasing runners, and she was over 2 minutes back from Gacek. Meanwhile McCoubrie was trying to stay close but had fallen a minute and a half back from Simonaitis. Still she knew that Broyles might not be that far behind, and she would have been right; Broyles was only 30 seconds back. A strong kick over the last 5K could close that gap. Gacek had the fastest last 5K with a 20:40, to build her lead to nearly three minutes as she claimed victory in 1:25:03. Simonaitis came in smartly with a 21:04, giving her 2nd place with two minutes to spare. McCoubrie was right to worry about Broyles’s kick as Broyles did, indeed, cut into the margin. But McCoubrie was able to tough it out and claim the final spot on the podium by 24 seconds in 1:30:11. Broyles, in 4th, had over three minutes on the rest of the field. This was Gacek’s 2nd National Championship as she added this crown to the one she wore in 2016 at Tulsa in the 15K Masters Championship. Simonaitis has now returned to the top flight of Masters Women runners after taking a short break from National Championships in the middle of the decade. McCoubrie managed an Overall podium finish at the age of 56, quite an accomplishment. Age-Grade scoring is the best way to compare performance by age across all Masters competitors. Each competitor’s time is assigned a score that is linked ot the statistically projected World’s Best time for the distance for a woman or man of their age. The score is 100 if the performance matches the projected World’s Best; if slower, the score falls. The following identifications are often made: 90% and up ‘World Class,’ 85% -89.99% ‘International Class’, and 80-84.99% ‘National Class.’ The Masters LDR Committee recognizes these distinctions in awarding Gold, Silver, and Bronze Elite Performance Medals for the relevant performance levels. The top 3 age grade scores for men and for Women merit gold, silver, and bronze commemorative medals and the top 5 age grade performers among the Men and the Women win cash prizes at this event. There were terrific perfomances and very close contests for both Women and Men. Suzanne Ray, 66, of Oregon’s Team Red Lizard, took the Women’s crown by running 1:42:55 for an 89.06. This is her first Age-Grading Championship. Ray has been ‘knocking on the door’ in recent Championships, taking 5th at the 8K and 4th at the 15K last year. Patrice Combs, 60, was only .27% behind with her 1:34:50 time, after finishing 4th in age-grading at the 10K in Dedham. Doreen McCoubrie, 56, finished off the Age-Grading podium by recording a 1:30:11 that age-graded at 88.57. That gives McCoubrie her second podium finish in two tries, along with her third at Virginia Beach. Michelle Simonaitis, 52, who ran 1:28:02 for an 86.29 and Ray’s Team Red Lizard teammate, Jeanette Groesz, 68, who ran 1:53:01 for 83.57, took home 4th and 5th place prize money. Club Northwest’s Rick Becker had the top Men’s score. Becker, 63, ran 1:20:18 for a World Class Age Grade of 91.45. Becker’s Coaching duties at Track and Field and Cross Country have limited his entries in National Championships, but he has made them count when he fits them in. He took 2nd in the Men’s 60+ race at Club XC last December, 2nd at the 8K in Brea 2016, and in the 10K at Dedham the same year. This medal will go alongside the one he won at the 2016 XC Nationals in Bend OR. 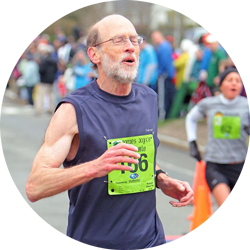 Gene Dykes, 70, of the Greater Philadelphia Track Club, pushed him with a 1:26:34 that age-graded only .37 of a percent lower. That is his second consecutive 2nd place age-grade, after finishing behind Nat Larson at Dedham. Dave Walters, 62, of Lisle Illinois, was less than a full point back in third, having run 1:20:37 for 90.21. Roger Sayre, 60, who ran 1:19:07 for a 90.18, and the overall winner, Mitchell, 44, who scored 87.77, took home prize money for 4th and 5th age-grade scores. As the top 5 overall Men’s finishers came from this age division, the summary of the Overall Championships provides the details for this division. The Overall Winner, Melissa Gacek, came from this division, as did 4th place finisher, Melissa Broyles. In this renewal of the battle of the two Melissa’s, Gacek enjoyed a bigger margin over Broyles in this contest than she had in the 5th 3rd River Bank Run a few weeks earlier. Gacek had a 4 min8ute margin over Broyles in that race. Here the margin was a bit over 5 minutes. Broyles had almost 20 minutes on the 3rd place finisher (from Ann Arbor), Lauren Kachorek. This was projected to be a duel between Garden State Track Club’s Jonathan Frieder and Philippe Rolly; Rolly beat Frieder by 12 seconds in the 8K Championship in March and by 2 seconds in the 10K Championship at the end of April. Would this have been Frieder’s breakthrough against Rolly? Perhaps, but we will not find out. Rolly, either because of injury, duty, or other possibilities, was not able to run the race. Frieder is quite dominant on the roads in this age division right now against all except the very top runners. And he proved it again, forging a 3 minute margin over Atlanta’s Brent Fields by the 10 mile mat and brought home the win in 1:14:20. Fields, in turn, built a 6 minute gap back to the 3rd runner in the division, Eric Green, by the 10 mile mark, and added to it over the last 3 miles as he claimed 2nd. When the Genesee Valley Harriers were unable to field a complete team for the Women’s 40+ division, the two runners who had entered decided not to make the trip. That left Erin Larusso, the Ann Arbor Track Club runner from Ypsilanti Michigan, unopposed. Larusso took the win with a nicely paced race. I had this division pegged as a duel among GVH’s Alan Evans, Playmakers Elite’s Eric Stuber, and the Ann Arbor Track Club’s Paul Mayer. Those were all good picks; unfortunately I overlooked Evans’s teammate, Mike Nier, who is GVH’s mainstay at distances from a mile up through the 10K. I had not seen a recent race for him at the Half Marathon distance or greater, so undervalued his potential. I saw that Nier had run 3:23:14 at Boston in 2017. That was under very warm conditions, so the time was not a good indicator of fitness for long distance. All ran strong races but Nier gradually established his dominance in the middle stretch of the rolling hills along Huron Drive. He crossed the ten mile mat in 1:00:41, with over a half minute lead on Stuber. Stuber, in turn, had a little over half a minute on Mayer and Evans who were separated by only two seconds. Nier powered all the way to the finish where he enjoyed a final margin of over a minute on Stuber who finished 2nd. The duel between Mayer and Evans ended with Evans steaming away for a commanding lead by the time they had traversed the last long hill into the finish. Evans was one of the few runners who was able to accelerate his pace over the last 5 kilometers; it gave him the final podium spot. Mayer could not stay within a half minute of Evans but he kept a two minute margin on Dale Flanders, who finished 5th. Michelle Simonaitis, who finished 2nd overall, ran away with the division, creating a 7minute gap on the field by the 10-mile mark and adding to it over the last 5 kilometers for a fine victory. Atlanta’s Kris Huff, and GVH’s Carol Bischoff were the two main contenders for the remainder of the podium. Huff gradually pulled away on Huron Drive, opening up a minute and a half lead over Bischoff as she hit the mat in 1:13:32. Huff almost doubled that margin, as she was able to finish strongly up the hill and into the finish. Bischoff enjoyed a 7 minute lead at the tape over Atlanta’s Susan Welch who finished 4th. I had this correctly as a battle between Connecticut’s Jim Zoldy and Garden State’s Gary Leaman but my research skated on by Rick Torres, in error. I should have noted at least that he ran 1:22:04 in the Kentucky Derby Festival Half Marathon at the end of April. That would certainly have focused my attention on Torres as one of the favorites. In any case, Zoldy certainly ran like the favorite, carving out nearly a two-minute lead on the field by the ten-mile marker. It was much tighter for 2nd and 3rd as Torres held a half minute lead on Leaman. Leaman, in the meantime, was holding the rest of the field at bay; no one else was closer than 5 minutes at the ten mile clock. All three runners held their pace well over the last 5 kilometers. Zoldy hit the finish line with a little over two minutes to spare back to Torres who, in turn, had 50 seconds on Leaman. Tim Lambrecht, Jaime Hartges, and Jeff Rothstein finished a tightly packed 4th, 5th and 6th , all finishing within a minute of each other 8 minutes back from Leaman. Finishing 3rd overall, Doreen McCoubrie had no trouble leaving her division rivals behind. By the ten-mile mark she had a 4 and a half minute gap on the field. But there were tight races for 2nd and 3rd and for 4th and 5th. Beth Ann Deciantis and Kelly Dworak were locked together heading down Huron Drive. Deciantis gradually grew a half minute lead by the ten-mile mark. Dworak was close; if she had saved extra for the final 5 kilometers, it could get interesting. Both runners stayed on pace though and Deciantis crossed the line 6 minutes behind McCoubrie, but with almost a minute to spare back to Dworak. Ann Arbor’s Nancy Schubring had built a 3-minute lead on the Impala’s Janet Smith by the ten-mile mat. Ordinarily that would be enough. But then the wheels came off for Schubring as her pace slowed and she faced the long uphill to the finish. Smith was probably unaware of the change but continued her steady pace, feeling good that she had saved enough to power up the final hill. In the end, Smith had taken two and a half minutes out of Schubring’s lead, a fine finishing job. But Schubring held tough up the final hill and across the line to claim 4th in 1:41:36. I knew this division was loaded. As noted above, the top 3 runners in this division took 3 of the top 4 age-grading prizes; the next two finished just out of the prize money in 6th and 7th—wow! Roger Sayre had broken 1:20 in a couple of Half Marathons last year and he looked like he was intent on doing it again. He cracked past the ten-mile clock in 3 ticks under an hour. But Rick Becker was only 41 seconds back, on pace also for a sub-1:20, and Dave Walters, in 3rd within striking distance another 33 seconds back. Three minutes back, Dave Burkhart, the noted triathlete, had a minute gap on a 3-man chase pack of Ann Arbor TC’s Michael Young, Norm Larson of Vermont, and Shore AC’s Reno Stirrat, all within 27 seconds of one another. Sayre powered through to the end, enjoying another sub 1:20 Half Marathon, hitting the finish line in 1:19:07. Becker hoped, no doubt, to close over the last 5 kilometers but found his pace flagging a bit. But the good work put in over the first ten miles plus his tenacity was sufficient to keep Walters at bay. Walters cut into Becker’s lead but in the end it was still a comfortable 19 seconds. Burkhart’s pace suffered the most of these top athletes but, like the triathlete he is, was able to keep the other contenders behind him as he fiished 3 minutes back from Walters. Young closed strong, taking 24 seconds out of Burkhart’s lead but he was still 44 seconds back, followed by Larson and Stirrat in 6th and 7th. Seven 60-64 runners finished under 1:27—amazing! Just like in the 10K Masters Championship at the end of April, Patrice Combs owned this division, building a 9 minute lead in the first ten miles and finishing it off with style and taking the win with a lead of well over 10 minutes on the field. Meanwhile the Team Red Lizard teammates, Lynn Bernot and Joanna Harper, were clicking off the miles. Bernot crossed the 10-mile clock in 1:20:59, with Harper three minutes back. Chasing those two were Ann Arbor TC teammates, Mary Aseltyne, and Carol Poenisch, who passed the 10-mile clock 4 minutes and 6 minutes after Harper. All four stayed on pace so the margins grew slightly over the last 5 kilometers except that Poenisch creeped a little closer to her teammate, finishing only 1:34 back at the finish line. Bernot claimed 2nd in 1:08:01 with Harper in 3rd place, four minutes back, keeping a gap of over 4 minutes back to Aseltyne who finished 4th. This division, too, was tightly contested with the top 4 finishing within 5 minutes of each other. Heath Hibbard, the fleet trail runner out of Colorado, was the favorite based on his 1:03:10 at the 15K Masters Championship in Tulsa last October. It appeared he could well break 1:30. Hibbard certainly ran the first ten miles as if he planned on breaking 1:30, passing the ten-mile clock in 1:07:00. John Hiirschberger ran 1:34:31 at the HM Championships last year but I downgraded his chances based on a relatively slower 1:14:20 effort at the Norcal 10 Miler earlier this spring. That time suggested he might not be fit to run much faster than 1:4. I figured Terry McCluskey would be closer to the low 1:30’s as he ran 1:11:06 in the Cherry Blossom 10 Miler. Hirschberger showed that the Norcal race was either an off day for him or perhaps one he was just running as a training run. In fact, he was running faster than last year, only two minutes back from Hibbard, running the first ten miles of this HM five minutes faster than he ran the Norcal 10 Miler. Perry Linn, from Iowa in his first National Championship outing, was only 13 seconds back from Hirschberger, and the better part of a minute ahead of McCluskey. With just over a minute between 2nd and 4th with 5 kilometers to go, the podium would turn on who had the most left. Hibbard had no trouble over the last part of the race, claiming first while stretching his lead to almost 3 minutes. Hirschberger was not able to stretch his lead but was able to take 2nd with an ample one minute lead over the third place finisher. One of the few reversals of fortune on the day took place as McCluskey had a strong last 5K and Linn struggled; McCluskey took 3rd with a half minute to spare. But there is no shame in a 4th place finish in a national championship on one’s first outing. And Linn kept several strong National Championship veterans behind him in the race. There was one other outstanding performance in this age division that does not jump out form the results listing. When I saw Jerry Learned before the race, I observed KT tape all over the front of his legs. His new dog is apparently very excitable about getting down the stairs and out the front door. A few days before the race, the dog lunged down, catching Learned off guard, and he was dragged down the stairs, acquiring the injuries that required the tape. No race for him, right? Then you do not know Jerry. When the Atlanta Track Club calls, he answers! You need one more runner for a 40+ team tyo get points from the Half Marathon. “Count me in if all you need is for someone who can run and finish, not go fast.” And run he did. It must have been painful. Ordinarily he would be running the race well under 1:40, perhaps under 1:35. It took him over two hours—Now that’s a teammate’s teammate! Team Red Lizard had the two entrants in this division. Both Suzanne Ray and Jeanette Groesz have been running strongly over the last year at National Championships. Ray has generally had faster times although the age difference means Groesz sometimes had the age grading edge. In the 10K Championship at Dedham, however, Ray finished behind her teammate, and with a slower time than anticipated. Was that just an off day or was there some lingering injury issue? Ray certainly put that question to rest over the first ten miles as she passed the digital clock at the ten-mile mark in 1:17:34, seven minutes ahead of Groesz. Ray carried her pace strongly into the finish, winning with a margin of just over ten minutes. Right now, Gene Dykes is enjoying life, running pretty much any distance he chooses from 3000 meters to 100 kilometers on the track on the roads or on the trails. He broke the Men’s 70 and up American Record for the Marathon with a 2:57:43 at Rotterdam in early April and broke the Men’s 70-74 American Record for the 10K at the end of April with a 39:02. In early February he had won his age division in the Rocky Raccoon 100 Mile Trail Run in just under 24 hours. If your jaw is dropping right now, join the club! He was a strong favorite to take this division by a ton and he did not disappoint. He crossed the 10-Mile mat in 1:06:17 with a four minute lead on a remarkable runner in his own right, Lloyd Hansen, the 2014 Men’s 65-69 Road Runner of the Year. After dealing with some sciatica and other issues, Hansen is on the comeback trail. Not quite all the way back, he is still formidable. Hansen had a 5 minute lead on Dave Glass who took three 70-74 National Championships last fall at distances from 5K to 15K on the roads and the XC turf. Glass, in turn, had five minutes on the rest of the filed. With such separation, it is not surprising that is the finishing order also. Dykes pushed his lead to 6 minutes by the time he crossed the finish line; Hansen upped his margin over Glass to 6:45. Paul Carlin [That’s me! ], was over 7 minutes back in 4th. I have been trying to shake a left hamstring issue for over two years and finally have nearly done so. But my conditioning is way off. I hope to be closer to Glass and the others in the fall, but time will tell. Przemek Nowicki and Curttis Walker were another 2 and a half minutes back in 5th and 6th. The only runner Robert Hendrick has to worry about in this division, even on an off day, is Doug Goodhue, who bested him at the 10K Championships in Dedham at the end of April on what Hendrick described as an ‘awful’ day of running for him. Hendrick was only talking about the quality of his run. He acknowledges that Goodhue is a great champion and will have no trouble winning championships once fully recovered from injury. Goodhue, of course, was otherwise occupied on this day, being the Race Director. As this was his last hurrah, it will be different next year; it will be great to see him out on the Dexter-Ann Arbor course again. Even though Hendrick had another off day as he was having foot problems, he still passed the 10 mile mat in 1:23:25 with a 7-minute lead on the field. Despite his difficulties, he kept most of that margin all the way to the finish line, crossing in first with a 6 minute gap back to the field. Charlie Patterson and David Cohen were engaged in a fierce battle for 2nd and 3rd. The issue was still undecided at the 10-mile mark even though Patterson had begun to pull away. Cohen was only 46 seconds back from Patterson’s 1:30:50, close enough so that if Patterson ran into trouble on the closing hill or if Cohen had saved more for the end game, there was time for a reversal. Instead. Patterson had the stronger finish as he pulled away on the final hill to enjoy a final margin of almost 3 minutes. Andrew Sherwood, the ‘Dean’ of the 75-79 HM competitors at age 78, finished in 4th. Even though there were not as many teams entered as we expect at shorter distances, there were still plenty of spirited contests. The Garden State Track Club-New Balance had a genuine complete team entered while Atlanta had a ‘let’s get some points for finishing’ team. Atlanta started with Brent Fields, 46, who usually competes on the 40’s team and added Mike Anderson, 61, and Jerry Learned, 69, from their 60’s team. Garden State is formidable and would be tough to eat even if other genuine 40’s teams showed up. They added this title to their win at the 8K and their podium finish at the ultra-competitive 10K National Championships in Dedham. Garden State had Jonathan Frieder 1:14:20, Sam Teigen 1:14:58, and Aaron Cooper combining for the win with a 1:16:04 average; that’s cooking! A fight between the Genesee Valley Harriers and the Ann Arbor Track Club was anticipated in the days leading up to race day. GVH had two runners entered who typically run on their 40+ team, Caroline Bucci and Melissa Senall. Surely they would find a third runner to field a complete time by packet pickup. Ann Arbor was scurrying to put a team together but they were successful by the end of packet pickup. To my surprise GVH was not able to get a third runner for a 40+ team and saved Bucci and Senall the trouble of a trip to Michigan. That meant Ann Arbor only needed 3 of their 5 members to finish to win the day. It was a much better effort than that! Ann Arbor TC took the title with scoring members Melissa Broyles 1:30:35, Erin Larusso 1:38:20, and Nancy Schubring 1:41:36. Mary Aseltine and Carol Poenisch were not that far back as insurance n case any of the top 3 faltered. The Ann Arbor Track Club, the Genesee Valley Harriers, and the Playmakers Elite-New Balance all had a strong horse to lead the way but which team woul dhave the depth to take the team title? GVH's Mike Nier was the fastest of the three leaders with a 1:20:21, followed by Eric Stuber of Playmakers in 1:21:32, with Paul Mayer leading the way for Ann Arbor with a 1:22:35. But a 1 minute or even a 2 minute lead after the first runners are in is not necessarily enough cushion to guarantee a team win. Depth is critical, and GVH had it. Their #2 runner, Alan Evans, came in just 25 seconds behind Stuber, giving them a strong 1-2 punch. After Mayer, the next runner in also wore the GVH singlet, Dale Flanders, coming across the finish line before either of the #2 runners for Ann Arbor or Playmakers. That gave GVH the team championship, and left Ann arbor and Playmakers to fight over the remaining podium positions. When Ann arbor's #2, Brian Zubatch, came in 3 and a half minutes ahead of the Playmakers #2, Tim Lambrecht, things were looking good. But as the Baseball Philosopher, Berra said, "It isn't over until it's over." Playmakers #3, Jaime Hartges, finished just a half minute after Lambrecht. That gave them a chance...but 14 seconds later it was over as Ann Arbor's #3, Jeff Rothstein came in to finish off their scoring. GVH won with a 1:22:21 average, followed by Ann Arbor in 2nd, averaging 1:28:00, and Playmakers 3rd averaging 1:28:44. Ann Arbor also ran a 'B' team consisting of Brian Harreld, Tassos Valtadoros, and Eric Barr that averaged just over 1:40 in 4th place. I had the Impala Racing Team pegged as the favorites but then their #1 runner, Dana Blum, did not show up. The other change from the expectation was that Atlanta chose not to field a 60 and up Women's team, allowing Patrice Combs to drop down and be the lead runner on the 50 and up team. Combs was the first #1 runner to finish at 1:34:50. followed by GVH's Beth Anne Deciantis a minute and a half later. When Atlanta's Kris Huff finished just a half minute behind Deciantis, that left Atlanta looking good for the win. Still, when Carol Bischoff finished just 3 minutes after Huff that gave GVH a little hope; they were 4 minutes back but a strong showing in the #3 slot could overcome that. But not today. The Impala's #1 runner, Janet Smith, came in next but then Atlanta's Maureen Martin finished almost two minutes ahead of GVH's reliable #3, Colleen Magnussen. That gave the win to Atlanta with a 1:38:58 average as GVH took 2nd with a 1:40:59 average. Once Smith's teammates, Teresa Quan and Irene Suzuki finished, Impala claimed 3rd with a 1:49:58 average. Not only did the Boulder Road Runners have the top #1 in Roger Sayre, they had stronger #2 and #3 runners also; Boulder dominated. Sayre finished anywhere from 6 to 9 minutes ahead of the #1 runners for other teams when he finished in 1:19:07. When Boulder's #2 and #3 runners, Martin Lascelles and Heath Hibbard, finished just 6 seconds apart in 1:28:41 and 47 respectively, ahead of the #2 runners for all other teams, that slammed the door. Boulder had the win with a 1:25:32 average. The race for the remaining podium spots was a real shootout between Ann Arbor, New Jersey's Shore AC, and GVH. Michael Young drew first blood, coming in at 1:25:52 but Shore's Reno Stirrat came in less than a minute later. If either Ann Arbor's or Shore's #2 could come in before GVH's #1, that would pretty well shut out GVH. But not this time, as Mark Rybinski, on the comeback trail after rehabbing a hamstring injury for well over a year, trailed Stirrat by just a minute and a half. Shore got the edge back from Ann Arbor when their Kevin Dollard came in a minute and a half ahead of Ann Arbor's Terry McCluskey. GVH still wasn't out of it though as their #2, Kevin Clinefelter, was the next runner in, two minutes back from McCluskey. GVH needed the next finisher to be theirs though. But not this time as Scott Linnell came in for Shore AC and closed the door on both Ann Arbor and GVH, taking 2nd team honors with an average of 1:31:45. Hugh Kuchta was next across the line, netting the 3rd place finish for Ann Arbor, averaging 1:33:26. GVH's Doc Rappole had a strong run, finishing a few minutes later, leaving GVH just off the podium with an average of 1:35:58. I had expected Atlanta to challenge Oregon's Team Red Lizard for this division title but n such luck. The Red Lizards won it unopposed, adding it to their first place finish at the 8K and their 2nd place at the 10K where they faced tougher opposition. Suzanne Ray led the way with a 1:42:55, followed by Lynn Bernot in 1:48:01, and Joanna Harper in 1:52:07. That gave them an average of 1:47:41. In my preview I speculated that Ann Arbor's Lloyd Hansen could stay with or come in ahead of Atlanta's Dave Glass. If that happened and I [Paul Carlin, Ann Arbor TC] could manage to stay ahead of Atlanta's #2, that should leave our teammate, David Cohen in a good position to close out the win for us. Hansen is on the comeback trail; at last year's HM Championship, he managed a 1:35:51 and then lost to Glass by a half minute at Tulsa. The 12K he ran earlier this spring on a tough 12K course suggested he could run 1:35 or 1:34 and that is about where I figured Glass would slide in. As it turned out, Hansen's last few w3eks of training must have gone very well as he ran two minutes faster than I expected. When Glass ran into some problems and finished over 6 minutes back from Hansen, Ann Arbor was in good shape. I had hoped to break 1:45 but I was not ready for that. Still, my 1:46:48 brought me across the finish line 2:43 ahead of Atlanta's #2, Curtis Walker, giving Cohen over 9 minutes to work with. As the 75-79 recap above indicated, Cohen and Atlanta's Charlie Patterson were locked in a tight battle for podium honors. Patterson won the battle for 2nd individual honors in 75-79 but Cohen stayed within three minutes, closing the door on 1st place. Ann Arbor averaged 1:47:37 to Atlanta's 1:49:50. Next up on the Masters Grand Prix circuit is the USATF Masters 5K Championship hosted by the Atlanta Track Club’s Atlanta’s Finest 5K, on Saturday, August 18 in Atlanta Georgia. The Atlanta Track Club is one of the premier Track Clubs in the country. Do not miss this exciting event! I was coming off an injury when I ran 1:14:20 at the NorCal 10 (which has a few miles of roller coaster hills), and the 134:31 I ran last year at the OC 1/2 came a week after the Dedham 10K. Them's my excuses for the poor times. One suggestion that I have for the Masters schedulers is that a greater effort should be made to have Masters National races in the San Francisco or LA areas. In the SF Bay area we have an extremely strong running community as evidenced by the large turnout at the XC 2015 Championships held in Golden Gate Park. A 10 miler that was tentatively scheduled for Sacramento was dropped, I was told, because of money issues - who would pay the officials' expenses.